Followers of the Wu-Tang Clan will be more than aware of the band's long standing, and incredibly vocal, fascination with martial arts and kung fu cinema. RZA, the de facto leader of the troupe, needs no prompting to announce his admiration for the genre and even provided the soundtrack to Jim Jarmusch's classic Ghost Dog: Way of the Samurai. 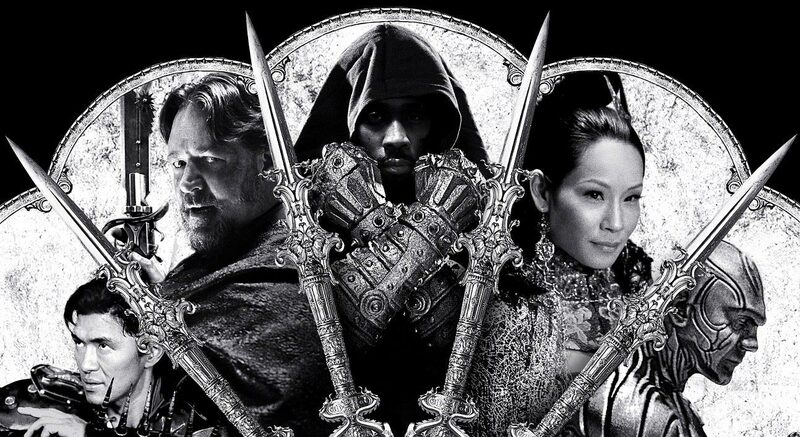 The Man With The Iron Fists, however, marks the rapper's first stint behind the camera as he directs his own take on grindhouse cinema and, in doing so, he's brought along quite an incredibly eclectic cast and crew who I can't imagine would have ever found themselves collaborating together under different circumstances. Quentin Tarantino puts his name to a feature which, I don't believe I'm being hubristic in declaring this, will be the only example of Lucy Liu sharing the big screen with Russel Crowe, former WWE wrestler Dave Bautista, and Sucker Punch's Jamie Chung in a movie based on a script co-written by RZA himself and Hostel director Eli Roth. Despite the presence of an Academy Award winner in the cast, the film, however, makes no attempt to have ideas above its station and, as is to be expected from a project headlined by Roth and Tarantino, is based clearly in the cartoony world of trash cinema, paying tribute and homage to the film-making techniques pioneered by genre giants who went before (particularly Hong Kong directors from the Shaw Brothers studio). Those expecting a new version of the classy, prestige take on martial arts pics as favoured by the likes of Zhang Yimou and Yu Ha in recent years will be disappointed; this is a movie aimed entirely at a different audience. RZA (who also soundtracks the movie) casts himself as the lead in his own film; a nameless blacksmith in a tiny little hamlet called Jungle Village. He toils daily to forge an array of weapons for the local warring factions but, alas, dreams of escape. Lion Clan's leader is murdered, causing events to spiral out of control as Silver Lion (Byron Mann) and his monstrous sidekick Brass Body (Bautista), Madam Blossom (Liu), the son of the slain Lion Clan leader, The X-Blade (Rick Yune), and a camply menacing Jack Knife (Russell Crowe) find themselves embroiled in was. RZA's Blacksmith is caught in the middle, wanting to remain neutral like Switzerland, with his only concern being saving enough money so he can run away with the kind-hearted prostitute, Lady Silk (Chung). The Man With The Iron Fists is a film which has a very specific audience in mind and is sure to be favoured by those who appreciate the works of Robert Rodriguez (in particular), Eli Roth and the more schlocky elements of Tarantino's Kill Bill features - it's not hard to see why the latter duo put their names to this movie. It's a feature which isn't going to change the world, nor is it one which tries to. The Man With The Iron Fists is simply made as a "lad's film" which can be enjoyed with a tin of lager or two on a boy's night in; it's not a great idea to watch Hero when in rowdy company and, if the subtitles of classic Jackie Chan might prove problematic, then The Man With The Iron Fists, a big, silly film which trades subtext for frentic fight scenes and wirework, could be the feature for you. * This film is available to purchase here at Zavvi who kindly provided a copy of this feature on DVD for me to review.